A gorgeous clustered wedding bouquet of all white David Austin roses bound with a rustic bakers twine. Simply divine! 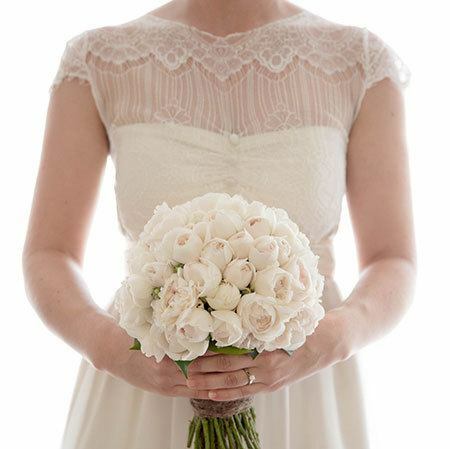 A variation of the bridal bouquet design is available for bridesmaids based on the above sized prices. Wedding bouquet handles wrapped either as `gripbound` or fully covered in white or ivory satin or organza ribbon. Optional bridesmaid bouquet handle either `gripbound` or fully covered in a satin or organza ribbon to match dresses (please specify preferences and ribbon colour details in the `Special Delivery Instructions Box`).